As usual I take took the Songserm ferry from Rasada pier from Phuket to Koh Phi Phi. The afternoon boat was full of westerners coming from Phuket Airport and the beaches on the west coast. The day was over cast because of the smog from the Indonesia fires but apart from that the sea crossing was wonderfully smooth for this time of year. It’s now been seven and half months since that terrible day when the tsunami hit the western seaboard of Thailand. A lot has changed since then. What was a thriving tourist area got stopped in it’s tracks by the destruction of the wave. 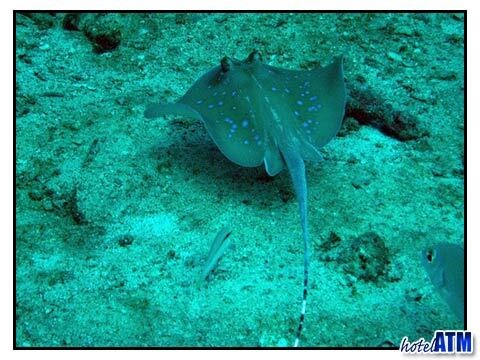 The families of the local Phi Phi island people completely altered forever by the horrific events of December 26th 2004. After the attention of the world the Phi Phi community had the tough task of picking themselves up again through caring for those injured, the orphaned, the relocated and rebuilding their homes but also putting back the tourist industry the vast majority depended on. The effects of the global media also extended the misery of the islands connected to the tourist industry as the European countries were given the impression that every single hotel and all infrastructure were demolished. In reality 98% of Phuket island was untouched by the Tsunami and was for the most part rebuilt and ready to take tourists back within 3 months. 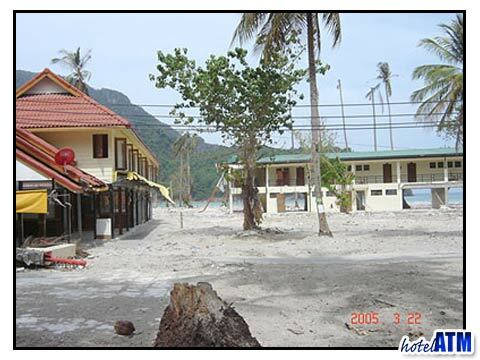 On Phi Phi Island where the destruction was greater, the resorts were taking guest back within 7 months. Many resorts were total unaffected and were operational within 3 months. However the global media ensured that the high season following the Tsunami was a poor one by failing to focus on the rebuilding process in a way that gave the traveling community confidence to visit again..
Phi Phi Island had a unique story where the decision to re define planning permission of bungalows and construction by the government departments had all but halted the reconstruction of the northern beach of Tonsai Village. This land where Phi Phi Princess, PP Charlie, Phi Phi Pavilion, Phi Phi Tonsai Resort was still empty and was replanted by coconut trees and wild grasses. This has turned a once built up beach front (well only bungalows in a coconut grove) into an open area with wonderful views of Loh Dalum Bay. Tourists sun bath on the beach on a deck chair and can now enjoy a cold drink and even a green curry from the Phi Phi Princess pool kitchen (which survived the wave). The central area of the island near Tonsai Pier (main pier of Phi Phi Island) is reopened but without the number of Phi Phi hotel guests that once made it unbelievably busy. Still, as the main street connecting the island with the rest of the island, it is already looking like it’s old self with Travel shops like Siam UK 1, bank, ATM’s, dive schools and souvenir shops. The center of the island is now the area developed by Phi Phi Hotel near the Reggae Bar where you get quality restaurants, guest houses like TTz, and Bars. It’s becoming a bit of a night bazaar area. Cheap Charlies, Tiger Bar and Boxing at the Phi Phi Reggae Bar give that old feeling of a happening place. More rooms up near the Phi Phi Andaman Resort have shifted the majority of the quality hotel accommodation further East towards Long Beach. Many of the family run hotels have upgraded and now have air-conditions a 2-3.5 star finish in the rooms and most now have a pool. The island is bracing itself for high season and many new guest houses will be ready for the expected full occupancy. 40 % of the days in low season have already been at full occupancy for most of the quality hotels so we expect a very full high season.